In life, there are certain endeavors that demand boldness, a devil-may-care attitude, a leap of faith: skydiving, bull running, driving in Bombay. Enter the Pickle Back, the cliff dive of drinks: a shot of Jamison accompanied by a “back” of briny pickle juice. According to the bad boys at Casey’s Irish Pub downtown, the saltiness of the juice adds an oh-so-piquant counterpoint to the sweetness of the Jameson. The suggested imbibing technique? “Sip and sip or slam and sip but never slam and slam.” Okay, no danger of the latter. You can try a Pickle Back at Casey’s for $11 tonight; $2 off the usual price. What food could possibly stand up to this daunting drink combo? Casey’s suggests their Black and Blue Burger (“special blackening spices” and melting Maytag bleu cheese on top) as the perfect accompaniment. ($11.50) Yes, Go Go’ers, tonight, salt is your friend. You may feel daring enough to drive a demolition derby after the Pickle Back. Please don’t, you’ve been drinking. Instead, walk over to the Mezz at the Alexandria Hotel for the Petrojvic Blasting Company‘s “celebration of its inaugural phonographic endeavor” A History of Public Relations Dilemmae. 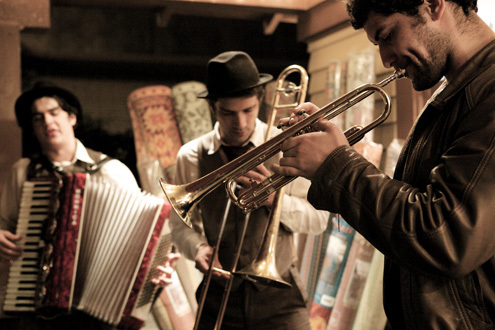 The brass-heavy band (which includes accordion and sousaphone) is releasing their first record of Balkan-inspired music a month before the downtown fave heads for Europe. Polka-ing optional but undoubtedly encouraged. Next Post CARTOON DUMP: Clinical depression, bad cartoons and Patton Oswalt.